The weekend getaway could have not started off any better. Our little family of 3 got to check into the Garden Court Hotel in Umhlanga. We were greeted at the entrance by a humble porter, who kindly took our bags and escorted us to reception. As we approached the front desk, we couldn’t help but notice the contemporary decor all around with colours and textures that gave off that feeling of relaxation. After the receptionist greeted us and handed us our stylish key cards, we were guided up to our suite on the 4th floor. We entered the suite and had a little welcome package waiting for us. A nice bottle of Nederburg red wine definitely tickled our fancy, followed by a nice treat basket of fruits and chocolates, now that’s what I call a perfect midnight snack. The best part about the suite is how kid friendly they made it for our little 1 year old. A beautiful pink cot was placed in front of the bed, just for her. Not forgetting the little kiddies pack they provided with some kiddie treats. The suite itself was so spacious and cozy. The space was perfect for our little one to play and crawl around in. Lets not forget, we cannot go without talking about our picturesque view of the Umhlanga coastline from our little balcony, truly beautiful. The weekend at the Garden Court Umhlanga Hotel allowed us to explore as much as we could. The Mnandi Restaurant in the hotel, caters for breakfast, lunch and dinner and serves a variety of light meals and refreshing beverages throughout the day. We got to try the buffet breakfast everyday, and let us say it did not disappoint. With a little business meeting taking place by the table next to us, we could see that this hotel is the perfect place for business visitors on the go. For our little one year old, I have never seen her so excited to be in the sand pit area, located outside by the pool of the hotel. There were little sand buckets and spades available to play with. Let’s not forget the large heated pool itself, perfect to swim in all year round, whether its hot or cold. They also have a little kiddies pool, which can be enjoyed by children of all ages. We, as a family definitely appreciate how kid-friendly Garden Court Umhlanga Hotel are. They made the stay so relaxing that we definitely felt like we were on holiday. If one parent was by the pool playing with the little one, the other got to have a little workout at the fitness center in the hotel. The hotel definitely make it easy for you to stay in shape. Whether you want to de-stress after a busy day, burn off some calories or just keep up your workout programme. 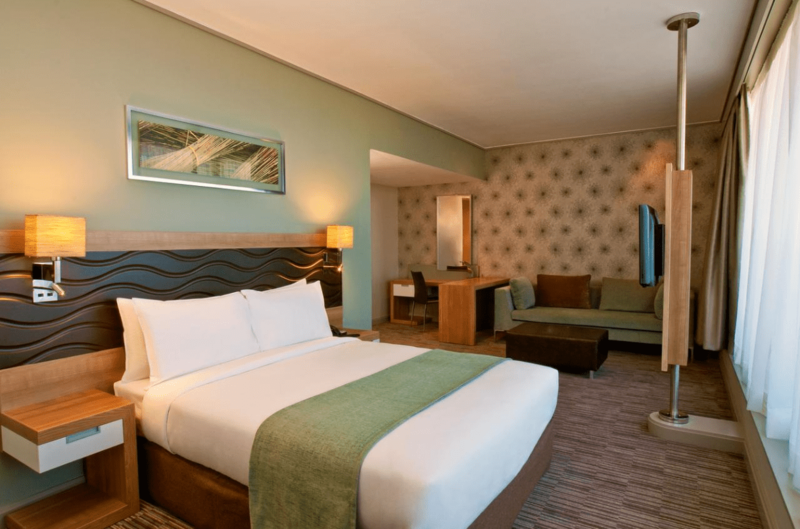 Garden Court Umhlanga definitely lives up to their expectations of comfort, convenience and affordability for families, holidaymakers and business visitors. We can see why they were given the 2017 TripAdvisor Certificate of Excellence.